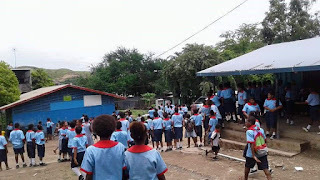 ​Three Grade 5 students of the Sacred Heart Primary School in NCD collapsed in their classrooms after breathing in tear gas that was used by police to chase away betelnut vendors at the Hohola market today. The Head Teacher Mr Pokatou Litau said the two girls gained conscious some minutes later, however the boy’s conditioned worsened so he was transported to the St Therese clinic at Hohola. Mr Litau and some of the teachers who were with him in the Administration building were shocked when one of the grade 8 girls ran into to the office struggling to breath with teary eyes followed by the news that three other students also collapsed. A disappointed Mr Litau said there should be guide line on of how much tear gas should be used in public places where there are children nearby. Mr Litau reported the incident to Hohola police but there was no sense of urgency shown by the officers there, so he went straight to Boroko police station and spoke to the NCD Metropolitan Superintendent Perou N’Dranou.